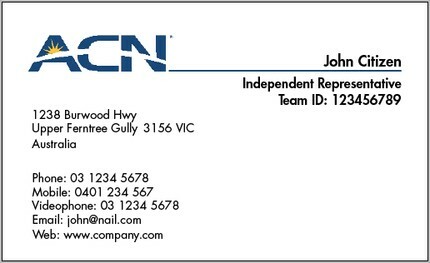 ​At Ferntree Print we specialize in printing ACN business cards for ACN representatives. We have automated the system to make it easier for you to order and quickly receive your printed material. Please follow the instructions below to order your ACN Stickers and Business Cards. Select whether you want Business Cards, Stickers or both. Select quantity required and fill in the delivery address. Enter the details you would like to appear on the card/sticker. Double check details on the card by viewing the proof created. Add any special printing instructions in the "Comments" field. Click "Order" and we will contact you to confirm your order and process payment.